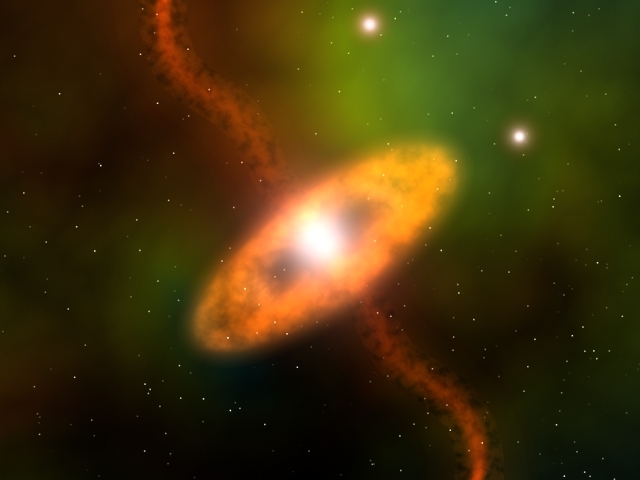 Astronomers using the National Science Foundation's Very Long Baseline Array (VLBA) radio telescope have found that an aging star is spewing narrow, rotating streams of water molecules into space, like a jerking garden hose that has escaped its owner's grasp. The discovery may help resolve a longstanding mystery about how the stunningly beautiful objects called planetary nebulae are formed. away from it in two directions. The astronomers used the VLBA, operated by the National Radio Astronomy Observatory, to study a star called W43A. W43A is about 8,500 light-years from Earth in the direction of the constellation Aquila, the eagle. This star has come to the end of its normal lifetime and, astronomers believe, is about to start forming a planetary nebula, a shell of brightly glowing gas lit by the hot ember into which the star will collapse. "A prime mystery about planetary nebulae is that many are not spherical even though the star from which they are ejected is a sphere," said Phillip Diamond, director of the MERLIN radio observatory at Jodrell Bank in England, and one of the researchers using the VLBA. "The spinning jets of water molecules we found coming from this star may be one mechanism for producing the structures seen in many planetary nebulae," he added. The research team, led by Hiroshi Imai of Japan's National Astronomical Observatory (now at the Joint Institute for VLBI in Europe, based in the Netherlands), also includes Kumiko Obara of the Mizusawa Astrogeodynamics Observatory and Kagoshima University; Toshihiro Omodaka, also of Kagoshima University; and Tetsuo Sasao of the Japanese National Astronomical Observatory. The scientists reported their findings in the June 20 issue of the scientific journal Nature. As stars similar to our Sun reach the end of their "normal" lives, in which they are powered by nuclear fusion of hydrogen atoms in their cores, they begin to blow off their outer atmospheres, then eventually collapse to a white dwarf, about the size of the Earth. Intense ultraviolet radiation from the white dwarf causes the gas thrown off earlier to glow, producing a planetary nebula. Planetary nebulae, many visible to amateurs with backyard telescopes, have been studied by astronomers for years. About 1600 planetary nebulae have been found, and astronomers believe many more exist in our Milky Way Galaxy. Some are spherical, but most are not, displaying a variety of often intricate, beautiful shapes. The fact that many of these objects are not spherical was long known, but a series of spectacular images made with the Hubble Space Telescope in 1997 reinforced that fact dramatically. "The problem for scientists is, how do you get from a star that we know is a sphere to a planetary nebula that is far from being a sphere and yet came from that star," said Imai. Some theorists suggested that old stars must be somehow producing jets of material that help form the odd-shaped planetary nebulae, but such jets had, until now, never been seen. W43A was known to have regions near it in which water molecules are amplifying, or strengthening, radio emission at a frequency of 22 GigaHertz. Such regions are called masers, because they amplify microwave radiation the same way a laser amplifies light radiation. Imai's team used the VLBA, the sharpest radio "eye" in the world, to find out where these masers are. To their surprise, they found that the maser regions are strung out in two curved lines, moving in opposite directions from the star at about 325,000 miles per hour. "The path of the jets is curved like a corkscrew, as if whatever is squirting them out is slowly rotating, or precessing, like a child's top wobbles just before it falls down," said Diamond. What is producing the jets? "We're not sure," Diamond said. "Traditional wisdom says that it takes a disk of material closely orbiting the star to produce jets, but we don't yet know how such a disk could be produced around such an old star," he added. The astronomers are probably very lucky to have caught W43A in what they believe is a brief transitional stage of its life. "Our analysis of the water jets indicates that they are only a few decades old," Imai said. "Once the star collapses of its own gravity into a dense white dwarf, its intense ultraviolet radiation will rip apart the water molecules, making observations such as ours impossible," he added. Planetary nebulae may be the worst-named class of objects in astronomy, because, despite the name, they have nothing to do with planets. The French astronomer Charles Messier discovered the first one, now known as the "Dumbbell Nebula" to amateur astronomers, in 1764. Sir William Herschel, who discovered the planet Uranus in 1781, later began a systematic survey of the entire sky and found more objects similar to the Dumbbell. Because their appearance resembled, to him, the appearance of Uranus in a telescope, he coined the term "planetary nebula," a name that has stuck ever since. Astronomers have long known that these objects are not actually related to planets, but the name has remained to confuse generations of students.